The Refiner's Fire Blog: "Who am I to judge?" Those were the now famous words by Pope Francis, uttered July 29, 2013 when, on a plane returning from Brazil, he was asked about gay priests. "If someone is gay and he searches for the Lord and has good will, who am I to judge? ", he said. With those five words, the Pope trampled the Word of God. This past week we saw a stark revelation of how far his words reached and how they resonate with the unsuspecting public. 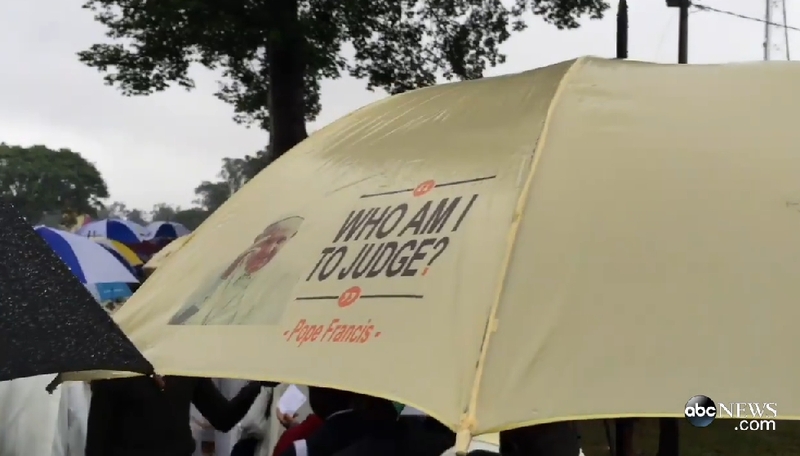 During the Pope's November, 2015 visit to war-torn Africa, what did we see but throngs carrying signs - even umbrellas - emblazoned with his infamous words. Most interpret these verses and the similar verses in Luke and John to mean that you should not judge. Period. But that is not what the whole of scripture says. If the Pope (and others) would actually read Scripture instead of revising it, they'd see that Yeshua was addressing avoiding judging others by the standard of your own judgment! YHWH provides for the standard of judgment and we are expected to use His standard when judging others. That standard is Torah! The issue is that we should not judge if we, ourselves are not obeying Torah and are instead judging by our own interpretation of righteousness. Paul taught only what Yeshua taught! That when you judge others by your own standard of iniquity you condemn yourself. But the oft ignored corollary is this: When you judge, you should judge only by the standard of truth, and that truth which Paul addressed is, and only is, Torah. Again, these verses do not tell us to judge others by our own standard. We are to use YHWH's standard! Instead of condoning sin, and hiding behind "who am I to judge", not wishing to "rock the boat", we are to attempt to correct our fallen brothers. Yeshua said so. (Read also Ezekiel 3:11-21 about how we are to tell our brothers to turn from their wickedness and if we don't tell them, we are held responsible!) Correcting our fallen brothers is righteous judging, but it is righteous judging if we apply the proper standard - Torah. And if we cannot bring our brother back into truth, we are to leave them to their own sin for they have denied YHWH and we've done all we can do. That is what the Pope should have said for when a brother who sins is rebuked, we are not judging - the judgement is by Torah. But today, Torah is ignored in favor of "changing the Church" to meet the desires of the people. How sad that the Church does not teach that it is the people who need to change to bring themselves in-line with the will of YHWH.